A feature was introduced during the recent PeopleSoft update to help alleviate the Journal Entry editing processing time. Please be sure to clear your cache for the most successful experience–see instructions to clear cache HERE. 1) The new message appears within the Journal Entry Lines Tab, when pressing the button. 2)Answer ‘YES’ if you would like to wait while system processes the journal. When processing is finished, remember to submit for Approval via the Approval Tab. Answer ‘NO’ if you want the edit process to run in Process Monitor, so you can continue onto another task. This process may take up to 90 seconds, so the system will LOCK the journal for processing. 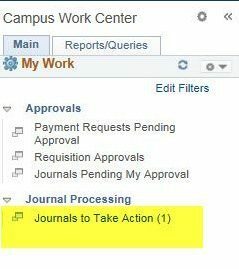 Then submit for Approval via the Approval Tab via the NEW link “Journal to Take Action” below. Alternatively, ” Find an Existing Value Tab” is still an option.